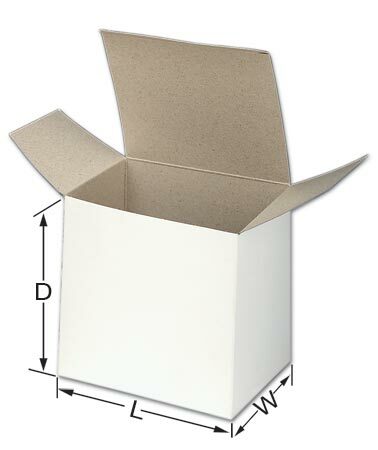 Home > Boxes & Corrugated Products > Chipboard Products > White Reverse Tuck Boxes > With Lengths of 2"
White Folding Chipboard boxes are made from sturdy .024 CCKB chipboard. If you don't find the size you need please call us. We can manufacture a size and style to fit any packaging need. 2 x 1-1/4 x 3"
2 x 2 x 3"
2 x 2 x 4"
2 x 2 x 7"
2-1/8 x 7/8 x 2-1/8"
2-1/8 x 1-1/16 x 2-1/8"
2-1/4 x 3/4 x 2-1/4"
2-1/4 x 2-1/4 x 2-1/4"
2-3/8 x 7/8 x 2-3/8"
2-1/2 x 1-1/4 x 2-1/2"
2-1/2 x 1-3/4 x 4"
2-1/2 x 2-1/2 x 4"
2-1/2 x 2-1/2 x 6"
2-1/2 x 2-1/2 x 8"
2-5/8 x 3/4 x 2-5/8"